Är det någon som känner till Total car diagnostics eller kollat på det http://www.totalcardiagnostics.com/ ? Det verkar intressant, de påstår att man an mappa om bilens ECU med det. This is a brief introduction on how to tune a sample car map file. NOTE: This is only a very brief introduction to tuning. There are many forums online on how to edit map files. 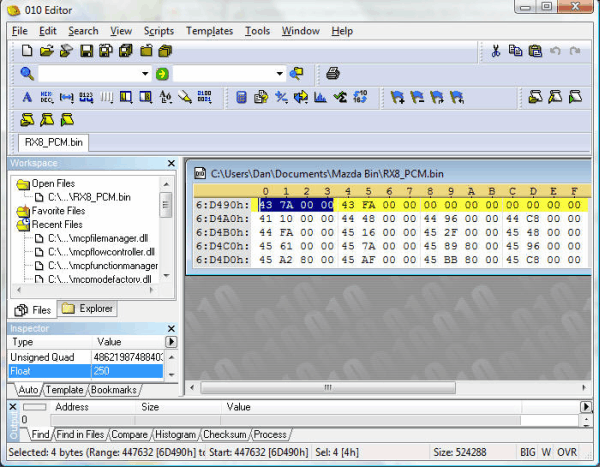 In the hex dump window you see a series of highlighted bytes, 43 7A 00 00, and in the Inspector window you see "Float 250". This is showing a map or constant value, in 32 bit floating point format, of 250. The next series of 4 bytes, 43 FA 00 00, is a value of 500. A value of 00 00 00 00 is a zero value. Notice there are lots of 32 bit floats in the area of memory. This is part of a table. 250, 500, 0,0, 9, 800, 1200, 1600, 2000, 2400, 2800, 3200, 3600, 4000, 4400, 4800, 5200, 5600, 6000 and 6400. The values 200 and 500 are not RPM based on the magnitudes (RPM would not normally be lower than 650), the values 800 thru 6400 are most likely RPM values used in a lookup table or map. The numbers in red represent RPM values, the green numbers represent Mass Air Flow and the numbers in the yellow matrix represent fuel injector pulse width. The longer the injector pulse the more fuel gets injected into the rotor. To find this table you would look for ascending RPM values, ascending MAP values and many fuel injector pulse values, RPM X MAP numbers, in this case 13X9. This is a purely hypothetical MAP for illustration only. Going back to the ECU hex dump, the ascending RPM numbers could be the start of a fuel map, or it could be a timing map, or possibly a map to control oil injection, at this time we don't know the definition of that map. To find a Constant, you need to know what to look for. An RPM limit would be a 32bit float at 9000 for a standard transmission car or 7500 for a automatic. You would do a search for "46 0C A0 00" to find all values of 9000. Pick one and change to 8000 and see if you hit the RPM limit. Not all values are stored as floats, there are also single byte values of 0-255, unknown if 16 bit integers are used. Once you take a look at the MAP area in memory, you will see it's nearly all floats or byte values. TOAD ECU Editor lets you locate the maps, faster and easier within the file. Är säkert bra, men kan finnas billigare. En förutsättning är dock att bilen kan accessas bra med ELM327 interface, vilket tyvärr inte är fallet för alla bilmodeller. Skulle man kunna mappa om en bil för E85 med denna eller liknande mjukvara? Jag tror det är möjligt med rätt kunskap.